Follow Friday Fun Week 13 - this weekly meme is hosted by Parajunkee and Alison Can Read. Check out their blogs for details/rules, and to join! Also, be sure to check out this week's featured bloggers on each of the girls' sites! This week's question: It's that pesky magic book fairy again! She has another wish: What imaginary book world would you like to make a reality? Anyone who's visited my blog regularly will probably already have guessed my answer. I really wish I wasn't so predictable, but in cases like this, I just can't help it. If I could have any imaginary world be a reality, it would be the world of Harry Potter - Hogwarts, Hogsmeade, Diagon Alley, yes please! I can't tell you how much I fell in love with this world and these places while reading (and rereading) the books, and then seeing them come to life in the movies. TGIF at GReads Week 9: TGIF is hosted by Ginger at GReads - be sure to check out her blog and join in the fun! This week's question: Book Disappointments: Have you ever come across a book you were so stoked to read, but it failed miserably in your eyes? I'm sure this has happened, but nothing comes instantly to mind. There have been so many books that people rave about and I wonder 'could they really be that good?' and then when I read them, I realize yes, they are actually that good. For the most part anyway, obviously that's not always the case. But it doesn't hurt that I'm pretty easy to please when it comes to books! 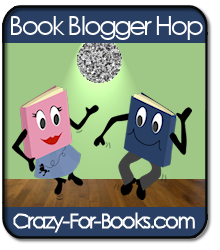 Book Blogger Hop Week 12 - This is a weekly meme hosted by Crazy For Books. Be sure to stop by her blog to check it out. This week's post is here. This week's question: As a book blogger, how do you introduce yourself in your profile? I don't have my Google/Blogger profile posted on the blog, but I have a short intro at the top ("Welcome to my blog! I have eclectic reading tastes so you'll find reviews from pretty much every genre (with an emphasis on YA, paranormal, romance, fantasy, and mystery), as well as a bunch of different bookish memes and information about my journey to becoming a published author - my debut novel, Blue Sky Days, will be released early 2012! "), and an About Me page in my tabs, where I talk about my writing, reading tastes, and add a few personal things. Happy Friday, book lovers! This week, I revealed the cover for my upcoming novel, and tomorrow I'm going to reveal the trailer! It was definitely a labour of love, and I'd be tickled (did I really just say that?) if you came back to check it out! I'm also going to be posting the link to my new official website. Don't worry, I'm still going to blog here, the website's just for information about my book and other writing. Have a fantastic weekend! Oooh--I went with Harry Potter as one of my top picks, too!--It's just such a magical world! Harry Potter is indeed a good choice, I'd love to spend a few hours in that world! I'd go with Harry Potter too so don't feel so predicable. Hopping through. Definitely Harry Potter! I'd love to visit Diagon Alley. And Hogwarts. Big congrats on your new novel coming out! What an accomplishment. Have a great weekend! new follower. Harry Potter would be so awesome!! I never get tired of seeing this answer lol The world is just so awesome. Harry potter always tops all!